History researcher, and Warwick Chaplain, the Rev Dr Stuart Jennings’ latest Book has helped Nottinghamshire County Council’s Archive service win a national award for publishing a book charting how a quarter of a county town’s population was wiped out in the 1640s. His book , has led to the council winning the the Alan Ball Local History Award which they will receive at a special ceremony on Wednesday October 12th. The award will be presented by Library Services Trust Chairman Michael Saich to County Council Chairman Councillor Keith Walker at Nottinghamshire Archives in Castle Meadow Road. It is in recognition of the support that archive staff have given to the Rev Dr Stuart Jennings for his book and also how he worked together with those staff to catalogue precious and previously undocumented papers which had been brought to Nottinghamshire County Council Archives from Newark Museum. The Rev Dr Stuart Jennings worked with the archive team to piece together parish and town records from the civil war period. The Rev Dr Jennings said: "I was delighted to hear that the archive service has won this award. My research there took place from 2002-2008 and at a time of austerity, I thought it showed great courage and commitment that the council understood the importance of this research and the team gave me such support. "What happened in Newark during the Civil War had not previously been highlighted especially from the perspective of local people and this book has been able to document and promote that. "On the historical side Newark, sitting on the banks of the River Trent and the Great North Road, was a prominent location during the Civil War. Key figures such as King Charles and Oliver Cromwell were present in that area at some point during the war. 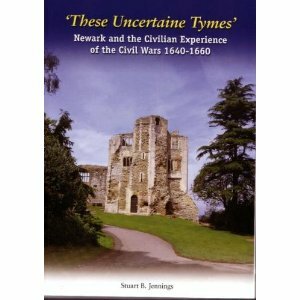 The Rev Dr Jennings research work for These Uncertaine Tymes, Newark and the Civilian Experience of the Civil Wars 1640-1660, was able to confirm that typhus (body lice) was the biggest killer in the winter and plague was the biggest summer killer among the civilian population during that devastating four year period in Newark. As well as the award, Nottinghamshire County Council’s Archives service has been awarded four stars in the National Archives self assessment of local authority archive services.